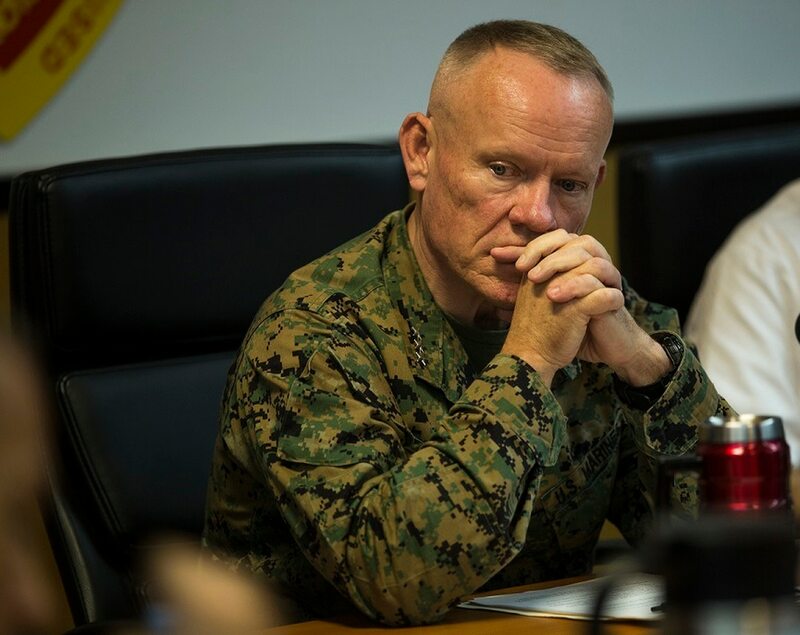 The three-star general leading all Marines in Japan acknowledged that he made a mistake in handling reports of drunken and lewd behavior by a colonel who was leading the Corps’ mission in Australia. The misconduct prompted Marine Col. Daniel Wilson to be fired only 11 days into a six-month rotation to Australia, where Wilson was the officer in charge of a forward coordination element for the Marine Rotational Force-Darwin in February 2016. But the colonel’s alleged misconduct prompted no formal investigation. “Upon learning of this officer’s actions in Australia, he was fired and promptly recalled to Okinawa,” Lt. Gen. Lawrence Nicholson said in a statement to Marine Corps Times. “I accept responsibility for not taking follow-on administrative actions, and for not placing this officer on the Officer Disciplinary Notebook," Nicholson said. In September, Wilson was sentenced to nearly five years in prison and the equivalent of a dishonorable discharge after a military jury at Camp Lejeune, North Carolina, found him guilty of sexually abusing a child, being absent without leave and conduct unbecoming an officer. The conduct unbecoming of an officer charge was in connection with Wilson’s time in Australia in early 2016. Wilson’s behavior during that time reportedly included making sexual comments to another colonel’s wife and sending crude Facebook messages to a female officer. The Marine Corps Inspector General’s office recently released a report on the handling of Wilson’s case. The IG report cited Wilson’s “excessive drinking and reported drunk driving,” according to a redacted copy of the investigation posted on the Marine Corps’ Freedom of Information Act website. Col. Daniel H. Wilson will receive the equivalent of a dishonorable discharge. Military.com first reported that the investigation had concluded Nicholson failed to report Wilson’s misconduct to the Marine Corps’ Military Justice Branch, which would have noted Wilson’s behavior in the Commandant’s Officer Disciplinary Notebook. Nicholson initially told investigators that he did not feel he needed to report Wilson to the Military Justice Branch, in part because his superior officer did not take such action. Retired Lt. Gen. John A. Toolan was serving as commander of U.S. Marine Corps Forces Pacific at the time. Corps officials decided not to recall Toolan back to active duty for the investigation. The command “displayed no interest” in Wilson after he recalled, and did not give Nicholson any guidance on reporting him. However, Nicholson also was skeptical about the allegations against Wilson from the beginning. Wilson told Nicholson that an Australian commander was behind the complaints against him, which boiled down to people not understanding his sense of humor, the investigation found. The investigation found that Nicholson had simply asked Wilson for his side of the story and accepted Wilson’s explanation that Australian military personnel had blown his behavior out of proportion. In fact, investigators found that Wilson had broken the law and Corps officials felt the Australians would have appreciated a formal inquiry into the matter. The investigation also found that Toolan and Nicholson both had enough information “based on the experience one may presume an O-9 in the Marine Corps possesses” to determine Wilson should have been investigated and have made a report to the Officer Disciplinary Notebook.